I feel it important that we recognize those queens that still bring their tiaras along for state visits to non-monarchies. It is, sadly, becoming more and more rare these days. 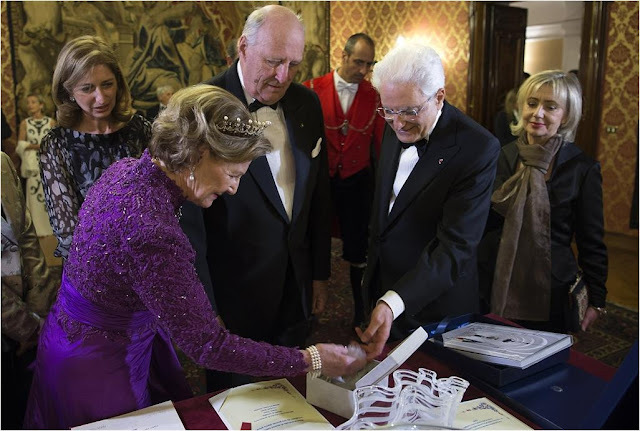 So thank you, Queen Sonja, for doing your bit for the good of tiarakind. 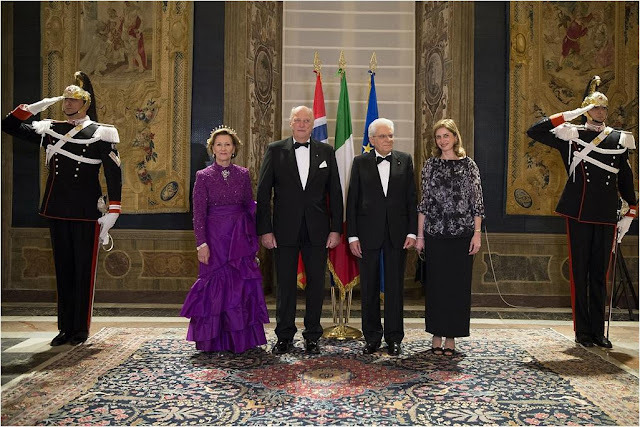 She and King Harald embarked on a state visit to Italy yesterday, and she brought the goods for the state banquet hosted by President Sergio Mattarella. She repeated a purple number we saw earlier this year for King Harald's Silver Jubilee. This dress is a lot like someone wrapped an extremely flouncy curtain around her lower half, basically - but tell me the home that housed such drapes wouldn't be your new favorite place. A saturated technicolor fairy tale, calling my name. One of my favorite Norwegian tiaras came out to play, Queen Maud's Pearl and Diamond Tiara. Queen Sonja prefers the larger setting of the flexible tiara when she's at home, but I love the chance to see her in the lower setting. This is actually my favorite version of the tiara. Simple festoon-y goodness, what's not to love?